We have a new product at Personalised Party - traditional button badges, customised with your own message and one of our lovely characters. 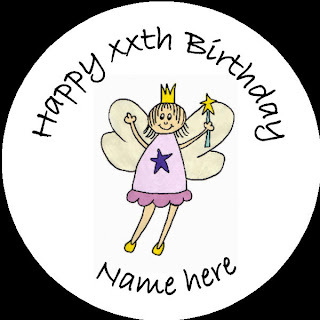 Choose from a dinosaur, monkey, fairy princess, pirate and a cow, and personalise the badge with your very own message. Now you can give the birthday boy or girl their very own unique badge, or make your guests feel extra special with a badge of their very own. If you are planning a wedding, these badges are also great fun for hen and stag nights, and fantastic to give out to the guests at your wedding. Why not give them out to your top bridesmaids and page boys? Follow this link to read more about our personalised badges. Dinosaur Mugs Back in Stock! 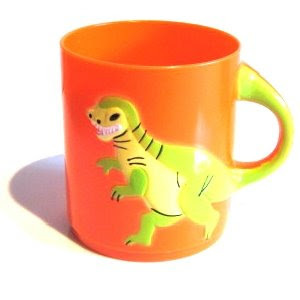 After a short absence, I'm pleased to say that our very popular plastic dinosaur mugs are back in stock! Like all our plastic mugs (including safari animals and sealife), these dinosaur mugs provide a great alternative to a party bag. Fill them with sweets, treats and small toys and wrap them in one of our cellophane bags, finished off with some curling ribbon, and your guest will be delighted, and as they are sturdy and long lasting, they won't end up in the kitchen bin as soon as they get home! Just as importantly, at only £1.00 each, they provide a unique party favour or prize at a very affordable price. Alternatively, save yourself a lot of time by letting us fill them for you by visiting our filled party mug section. Very versatile, they make excellent toddler mugs, tooth mugs, toy and pencil tidies, paint brush mugs and bath toys, so there's no wonder they are amongst our best sellers. 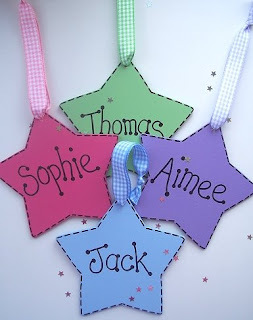 Personalised Party have a lovely new product - handmade personalised wooden stars. Each star measures approximately 12.5cm across. They are available in a choice of colours and have matching gingham ribbon. These stars make really unique personalised party bag fillers, or wedding favours for children. We love them and hope you do too! You can now buy personalised white kraft paper party bags for only 80p each! We've slashed a whopping 20% off these best sellers at Funky Dory Party Bags. In assorted designs specially selected for their wide appeal to children, and customised with your own message, you can give your young guests a touch of luxury on a budget. 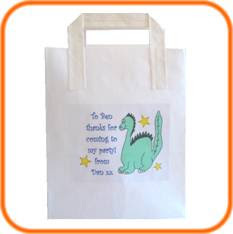 For luxury personalised recycled party bags, in assorted colours, take a look at our new sister site, Personalised Party. We adore these new wooden springy creature pens that have just arrived - and yes, they really do go boinnn-ggg! Well, kind of. 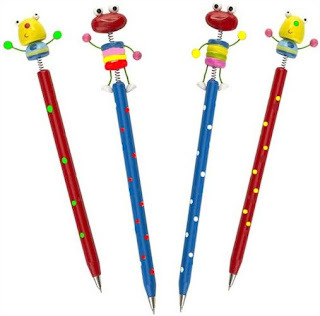 The pens are painted in assorted bright colours and decorated with funny creatures on springs. They are sure to liven up homework, and we defy any child not to smile if they're lucky enough to find one in their party bag. We're not sure what the creatures exactly, but they seem a bit like aliens to us. What do you think? We're constantly adding to our collection of party bag fillers, so don't forget to pay us a visit before your next party! Do you bake? Or, like me, do you often think about baking but never get round to it? Either way, it's worth taking a look at this new website I've found called Mums Who Bake. They have a chat forum, as well as a section on tips, and lots of lovely recipes - including ones for my favourites - banana cake and chocolate fudge cake. They also have an online shop where you can buy all the equipment and embellishments you need. I particularly like their section on baking for a party, and in particular, their lovely little Fun Pix. You can attach messages, pictures or photos onto them and stick them in cupcakes to liven up the party table. They are particularly useful as place name holders. Also, if you're really creative, you could decorate each child's differently and personalise it with their name label in a Fun Pix and hand them out with the party bags as they leave. 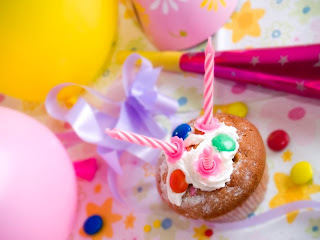 If you do fancy your hand at baking for your next birthday party, as well as our own party food ideas, it's well worth a visit to the recipe section at Mums Who Bake.